Vertical mixers have become increasingly popular in the dairy industry for creating total mixed rations (TMR) efficiently for herds. The beef industry has also recognized the potential of feeding their herds a TMR for better body condition and value. Doing research is critical to get the correct mixer size for your operation. If you are going to invest in a vertical mixer, it is important to research the extra features and options available. Mixer magnets are highly recommended because they prevent animals from ingesting potentially dangerous metallic items located in feed. Metal items can cause Bovine Traumatic Reticulopericarditis (commonly called Hardware Disease). Hardware disease causes stomach issues, poor appetite, pain, drop in production, and in severe cases, death. Even a minor case of Hardware disease can affect your bottom line. The best method to stop it? Prevention. That is where mixer magnets come into play. If tramp metal is stopped from entering the animal, you will never have to worry about Hardware Disease. Any loose metallic items present in feed ingredients will be pulled out of the ration while being blended. 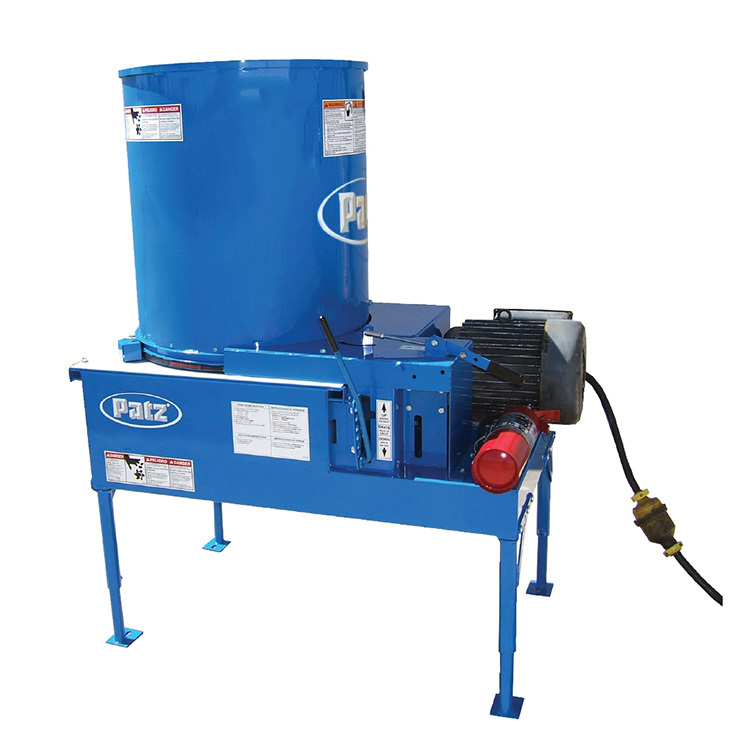 At Patz, we know our patented tub-mounted magnet is uniquely the best in the industry. 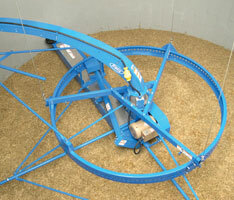 The two-step retention design allows the feed to flow unrestricted while mixing. Feed travels over the slope of each step on the magnet, while metallic items drop into the step corner. Materials stay secured to the magnet throughout the entire mixing process. Our magnet pulls tramp metal out of TMR ingredients while being mixed together. Protect what matters and get peace of mind by removing metal from the TMR before it leaves the mixer. Patz Corporation was recently joined by Machinery Pete at the National Farm Machinery Show in Louisville, KY. On Thursday, February 14th, Greg Peterson of Machinery Pete spent time at the Patz booth discussing the 1600 Series II 620 TMR Vertical Mixer. Patz Sales Manager, John Runge, shared with Machinery Pete the 70+ years of Patz Corporation’s history, from the start of the company to the growth of a widespread, worldwide dealer network. 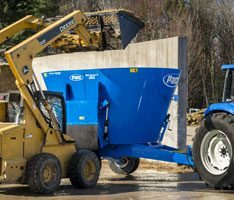 Explaining how the patented technologies work together to create Balanced Flow™, Runge reviews the tub-mounted magnet and patented contoured baffles and how they help to create a well-blended TMR. Stearns Bank Account Manager, Craig Kern, spoke about the financial trials facing farmers recently. Craig stated that customers are looking for a dependable product with financing that meets customer needs. Local Patz Dealer, Harold’s Equipment, was working the booth and spoke briefly about the dealership’s history with Patz and the Patz product line. Also, at the booth was Pat O’Brien from DOM Distribution in Australia. DOM was recently named the #1 Patz International Sales Distributor for 2018. Celebrating their 10-year anniversary with Patz Corporation this year, O’Brien values the trust in the service and product that Patz has been able to offer DOM. District Representative, Kevin Habeck, has worked for the Patz Corporation for 34 years. He reviews how the company and products have changed over the years to keep up with ever-changing customer demands. Greg Peterson (AKA “Machinery Pete”) has over 25 years’ experience in the machinery business. Called one of “The most trusted names in farm equipment,” Greg has an auction and used equipment website that is a popular destination for farmers and dealers. Machinery Pete also has a weekly TV show reviewing farm equipment. Check out the video below for the full interview! 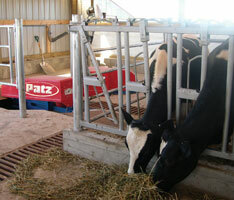 Patz IntelliChain® Alley Scraper is engineered to handle manure removal automatically. This machine has three operation modes that can be programmed using the SmartSense® Control Panel. The panel is smart enough to “learn” and adjust to the weather, bedding, and manure changes. It also has a “bump” feature that pauses and backs up the scraper if it runs into an animal or obstacle. 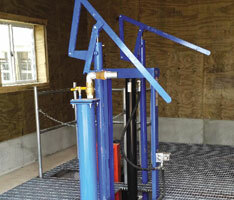 Flexible design options make this machine great for fitting into most barn layouts, including existing barns. The drive has 4 different configurations for the chain to travel through. There are also 3 different scraper types for different alley widths and route types.